Field trips are beneficial for students in so many ways. #1. Get your students moving. It’s obvious that activity is important for kids’ growing bodies, but did you know that it also plays an important role in learning? That’s right, when kids get moving, it also impacts their brains in wonderful many ways. Physical activity helps to improve mood, cognition and attention, which all have a positive impact on academic achievement. Most field trips involve a little walking and a lot of looking and listening, which is great, but with our treetop adventure course, your students will climb, stretch, balance and push themselves to new heights. #2. Build confidence in your students. Confidence is important for everyone, no matter how old you are, but it’s especially important for kids. Kids who are confident are more likely to try new things, which is how they learn and grow. Self-confidence also helps kids stand up better to peer pressure and makes them more willing to take on new responsibilities. There are lots of great ways to foster confidence in kids, but challenging them with an aerial adventure is one of the best. 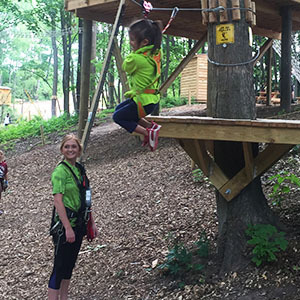 With ziplining and other treetop activities, your students will learn to be daring and take risks that boost their confidence in a safe environment. #3. Help your students experience the many benefits of being out in nature. The classroom is a wonderful place for learning new things, but spending too much time inside isn’t good for kids. Getting out in nature every once in a while is beneficial in so many ways. For one, it helps to support cognitive functioning and creativity in young minds. Two, spending time in nature helps kids to become more resilient to life’s stressors, and it helps to reduce anxiety. Last but certainly not least, being in the great outdoors sparks respect and curiosity about the environment and nature. Book your TreeRunner Grand Rapids field trip today! If you’re looking for a great field trip idea, and you don’t want to settle for the same old trip to the museum, it’s time to book your adventure with TreeRunner Grand Rapids. 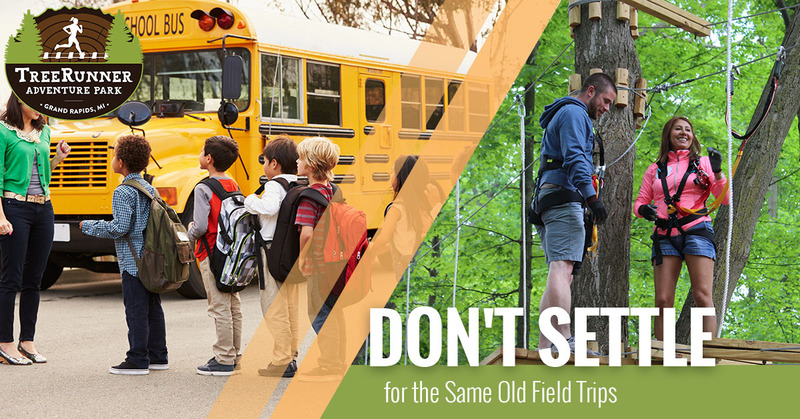 Whether you’re teaching your students about biology, ecology, physical health or team building, there are so many amazing lessons to be learned while your students are having a blast up in the trees. We host groups from as small as 10 people to groups of more than 200 people, and we offer free bus parking on-site. Learn more and book your field trip today!